You may wonder why we are all dressed up in these fabulous wigs, and where we are eating! Well, this is post two about Amanda's Bachelorette Party in Tulsa. You can see our fun times at COUfest here. 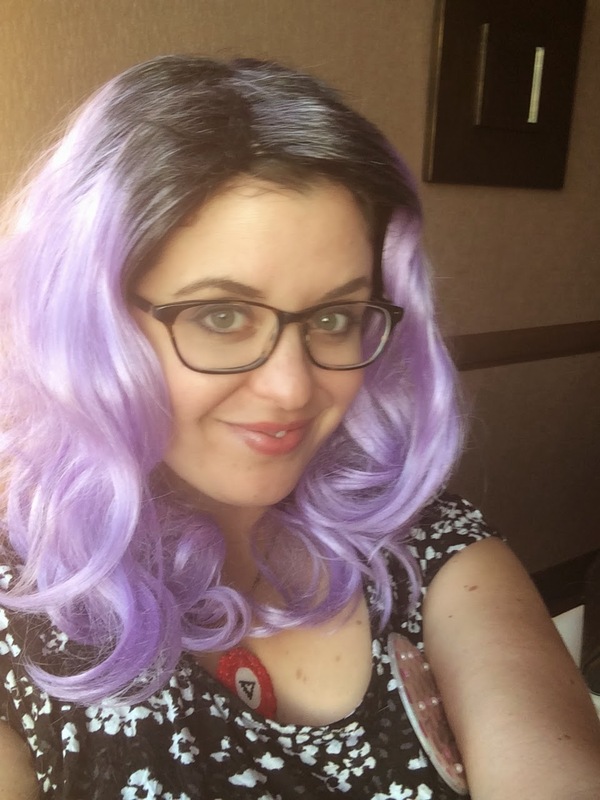 The first night of our trip, we checked into the Hard Rock Hotel and Casino, then we got all dolled up in fun wigs. After we were ready for the night, we headed up to the 19th floor to McGill's, a very nice restaurant overlooking the area. Yes, my wig is weird looking. I ordered a different one, but it never showed up, so I had to scramble to find one. It was still really fun. Our waiter immediately informed me that the chef would be happy to make a vegan dish. I was really excited. He said that in the future, you can always call ahead and the chef will make sure he has ingredients to make something really stellar. Once I knew where dinner was headed, I started looking at the drinks. Moscow mules were the special, so I ordered one! The drink was delicious! By that time, we were all pretty hungry, so we told the waiter to keep the bread coming. Everyone practiced their fancy sipping! Soon, our salads arrived. The waiter made sure to let me know that the balsamic vinaigrette had honey in it, so be careful. The staff seemed incredibly knowledgeable about veganism, and I felt confident that I was going to get a great meal. The salad was really delicious, and before our entree, we were treated to a lemon sorbet palate cleanser. Yum! Dinner arrived, and I couldn't wait to dig in! The bell pepper was cooked beautifully, and it was soft and easy to cut. The risotto was flavorful and packed with vegetables. The meal was huge, and I couldn't finish it all. I was really happy that I ordered it. If I ever find myself at the Hard Rock again, I'll be sure to come back!